Here's how they do it in Oregon. Statist dirtbags like Alan Contreras must be so proud today. Quote: Look upon a dangerous Oregon scofflaw! 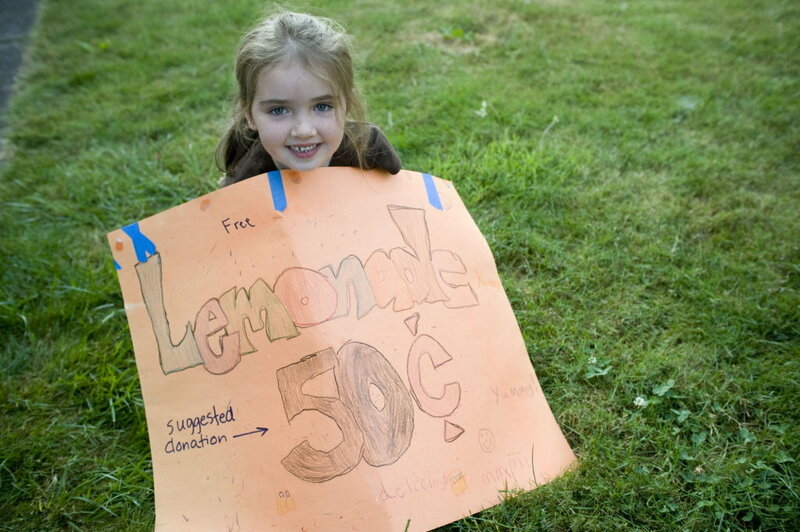 Her name is Julie, she’s seven years old, and she decided to sell some lemonade at a Portland, Oregon art fair… yes. You know precisely how this ends: it ends with a county public sector union employee with a clipboard making a seven year old cry by threatening her with several hundred dollars in fines for not having the right permits. And with the spokesmen for various public health departments justifying having their public sector union employees making a seven year old girl cry because, hey, you have to protect the public and the law’s the law. PS: Hey, if Blue State/Democratic-controlled governments want to avoid being raked over the coals because their convoluted regulatory schemes keep throwing up scenarios where public sector union employees have to threaten seven year old girls and make them cry, here’s a thought: don’t make the regulatory schemes quite so complicated. True, doing it that way requires one faction of the Democratic party (public sector unions) to have a fight with another faction (trial lawyers), but why is that my problem? Alternate headline: “Blogger posts greatest anti-statist story ever.” No foolin’. You don’t even need to read it; just look at the photo. Dude. Dude. New midterms plan: Buy the pic, slap it on every piece of GOP campaign literature that’s sent out from now until November, net 100 seats. Julie was careful about making the lemonade, cleaning her hands with hand sanitizer, using a scoop for the bagged ice and keeping everything covered when it wasn’t in use, Fife said. After 20 minutes, a “lady with a clipboard” came over and asked for their license. When Fife explained they didn’t have one, the woman told them they would need to leave or possibly face a $500 fine. Surprised, Fife started to pack up. The people staffing the booths next to them encouraged the two to stay, telling them the inspectors had no right to kick them out of the neighborhood gathering. They also suggested that they give away the lemonade and accept donations instead and one of them made an announcement to the crowd to support the lemonade stand. That’s when business really picked up — and two inspectors came back, Fife said. Julie started crying, while her mother packed up and others confronted the inspectors. “It was a very big scene,” Fife said. Supposedly the inspectors only cracked down because she was at a street fair, not in her own front yard, and therefore she was, according to an inspector, “suddenly engaging in commerce.” Which is both depressing and refreshing, insofar as his definition of “commerce” is actually more credible than the Supreme Court’s. Says the girl’s mom, uttering a line destined to be crocheted on pillows in many a tea-partier’s rec room, “It’s gotten to the point where they need to be in all of our decisions. They don’t trust us to make good choices on our own.” Exit question: Is this the most insane licensing-related story of the day? Exit answer: No. Quote: After 20 minutes, a “lady with a clipboard” came over and asked for their license. When Fife explained they didn’t have one, the woman told them they would need to leave or possibly face a $500 fine. Thank g-d those great Americans won the war against those sick Nazis...I never met one, but I heard on TV they were insane control freaks, indexed/barcoded people they disliked and even killed many...that is why they are referred to as the absolute evil, right? I even heard they blindly enforced any sick law the big shots passed, without thinking...there was this guy wearing a funny hat on TV who was screaming to the top of his lungs about how immoral that is...but great Americans are the good ones, right? Quote: As for Julie, the 7-year-old still tells her mother "it was a bad day." When she complains about the health inspector, Fife reminds her that the woman was just doing her job. She also promised to help her try again -- at an upcoming neighborhood garage sale. Did Nazis have jobs, too? Isn't Oregon that cesspool teeming with Antifascist groups and other left wing flop house warriors? Yes the death camp guards were just doing their job. When a bureaucrat can't perceive the subhuman activity in which they are participating they are no worse. The problem is capitalism. If it was the lemonade dole, that would be a different story. Fascist bastards. Ben Johnson Wrote: Yes the death camp guards were just doing their job. When a bureaucrat can't perceive the subhuman activity in which they are participating they are no worse. What did the "broad with a paperclip" want to do, exactly?